The Pericardium (G. around heart) is a fibroserous sac which encloses the heart and the roots of its great blood vessels. The pericardium is located inside the middle mediastinum, posterior to the body of the sternum and 2nd-6th costal cartilages and anterior to the middle 4 thoracic vertebrae (i.e., from T5 to T8). A. Heart with its vessels and nerves. D. Superior vena cava (lower half). E. Inferior vena cava (terminal part). F. Pulmonary veins (terminal parts). 2) inner double layered serous sac termed serous pericardium. A little description of embryology makes it easier to understand the formation of different layers of the pericardium. The heart and great vessels be located within the fibrous sac and invaginate the serous sac from behind during development. Consequently, the external surface of the heart and internal surface of the fibrous pericardium are covered by a layer of serous pericardium. The layer covering the surface of the heart is named visceral pericardium or epicardium and the layer covering the inner aspect of the fibrous pericardium is termed parietal pericardium. The intervening potential space between the 2 serous layers is termed pericardial cavity. 1) Fibrous layer of the pericardium. 2) Parietal layer of the serous pericardium. 3) Visceral layer of the serous pericardium (epicardium). The fibrous pericardium is strong fibrous sac which supports the delicate parietal layer of the serous pericardium with which it’s firmly adherent. A. It’s conical in shape. B. Its apex is blunt and fused with the outer coats of the roots of great blood vessels (e.g ascending aorta, pulmonary trunk). C. Its base is broad and blended with the central tendon of the diaphragm. D. Anteriorly it’s connected to the posterior aspect of the body of sternum by the superior and inferior sternopericardialligaments. E. Posteriorly it’s related to principal bronchi, esophagus, and descending thoracic aorta. F. On every side it’s related to phrenic nerves and pericardiophrenic vessels. In quadrupeds the fibrous pericardium is divided from the diaphragm by serous infracardiac bursa. The serous pericardium is a thin serous membrane lined by mesothelium. It’s double layered, the outer layer is named parietal layer and the inner layer is named visceral layer. The outer layer lines the fibrous pericardium and is reflected around the roots of great blood vessels to become continuous with the visceral layer of the pericardium. It’s termed parietal pericardium. The inner layer is closely applied to the heart with the exception of along the cardiac grooves, where it’s divided from the heart by blood vessels. It’s referred to as visceral pericardium or epicardium. The 2 layers of serous pericardium are continuous with every other at the roots of great blood vessels (example, ascending aorta, pulmonary trunks, superior and inferior vena cavae), and superior and inferior pulmonary veins where the pericardial sac was invaginated by the developing heart. 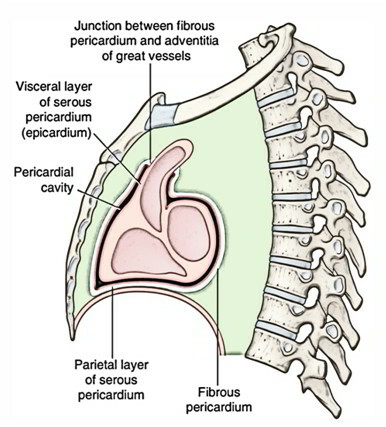 The slit-like potential space between the parietal and visceral layers of serous pericardium is called pericardial cavity. Normally it includes a thin film of serous fluid (about 50 ml) named pericardial fluid which lubricates the opposed surfaces to avoid friction during the movements of the heart.